"Perhaps it's time to shut down $17 billion worth of money going for reconstruction projects, when our track record really stinks," Senator Claire McCaskill (D-Missouri) asserted on Thursday. C-SPAN Video Library in case you missed appreciating Senator Claire McCaskill's justified performance on the subcommittee (one of many chaired by McCaskill on the topic of waste), the video would be added here but I may have tried too soon. The formidable lady once again is not hearing the answers she wants and seems to be unimpressed with the unaccountability factor so rampant whenever Pentagon and private contractors toss in their lots with the US Department of Defense, the big-daddy bank roller in our messy Mesopotamian Occupations. Among those called upon this week to testify as to who's in charge of our financial fiasco overseas, an Oath of Un-Accountability seems to have been taken yet perhaps McCaskill's pointed questioning will cause a majority of the American people to insist that Saturn's lessons of accountability and frugality be honored as August 28, 2011 nears. This date brings orbiting Saturn's return to sign and degree in America's natal chart of July 4, 1776 (14Lib48) and is under girding the current Debt Ceiling 'crisis' on Capitol Hill and the global financial results if the US defaults on her debts for the first time in our nation's history. Can you imagine that the ones now driving the Washington jalopy of government want that little item of default to appear on their precious political resumes? They're total dolts, if they do. As you know, INDEPENDENCE and FREEDOM are words and concepts from the realm of planet Uranus, discovered by William Herschel in 1781 at a time betwixt the American and the French Revolutions, with US natal Uranus @ 8Gemini55 and ruled by Mercury. As in any horoscope, the sign of Uranus describes basic behavior, and we, as a nation and a populace, generally behave as if we're merely a bunch of youth-idolizing, never-grow-old, communicating, sometimes duplicitous, of-two-minds, quick-witted yet superficial Geminis, sign of the Jack of All Trades, and The Trickster. Meanwhile, our Saturn Return demands maturity! Interestingly, transiting Hermes, aka, the trickster, magician, and alchemist, now sojourns beside traveler Uranus in early Aries! And Ebertin gives Uranus in Aries as, Utopians, which may well describe the sectarians who now force their slight-of-hand ideology upon congressional legislation on Capitol Hill in order to gum up the wheels of government. As you know, neocon Utopians want to drown all government (except for their own brand of anarchy) in a big'ole bath tub. So this post is meant to be my Ode to Independence Day 2011 and I hope that if you've not yet witnessed or read Senator McCaskill's questions and remarks to certain contractors and others associated with construction projects in Afghanistan, you'll check it out with a sense of the true "Spirit of '76" as we may express it in 2011. And I'm sending out a prayer for the future of our nation on this Fourth of July, a future without the throttling of life and the thievery of our treasury by the military industrial complex and their in-cahoots operatives and bankers, parasites as they be. As noted, this chart is useful as a natal horoscope for America (visit Michael O'Reilly's Neptune Cafe for more info - he champions this chart), or as a Spying Agencies horoscope timed by our first postmaster - aka, spymaster - Benjamin Franklin smiling enigmatically upon the US 100-dollar-bill as the Hour is shown upon the face of Independence Hall Clock, Philadelphia, just behind Old Ben, the Uranian genius. Plus, my point is that Dr. Franklin organized our early gaggle of scouts and spies into a more cohesive network of surveillance operatives. And my, how their web has grown. No chart details are given today (for our holiday weekend is here!) 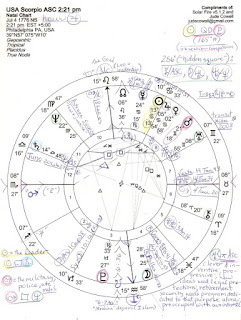 But if you wish to read a few brief notes previously published concerning the US Scorpio Rising chart (the above image is shown there as well), then of course you freely may. 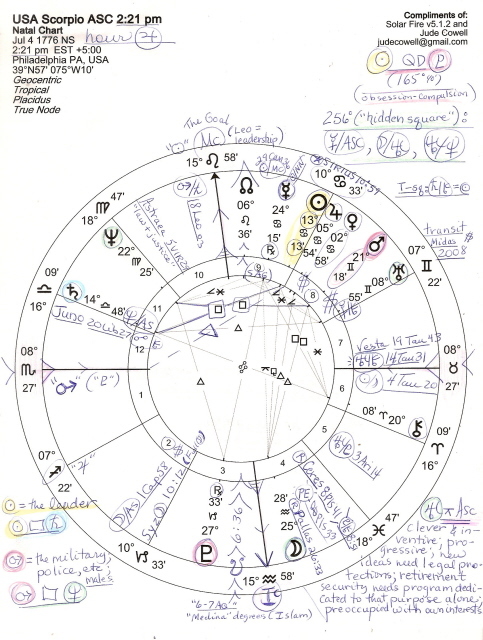 You'll find that the post focuses on the hidden square which appears in any version of the US natal chart you choose to use: 256 degrees between Uranus and Neptune, the enlightened ones. This aspect has an unconscious flavor which is why it's "hidden" so at first, some Americans may experience a 'that's not me!' or 'that's not us!" reaction. But if you will, let its implications and assertions sink in especially considering the dire circumstances our society is dealing with for Independence Day 2011 - and considering that it's the citizens of GREECE protesting Saturn's austerity cuts in the streets while we-the-people lounge next to our hamburger grills, freedom fries supposedly on our menus. Do enlarge the image if you like, by clicking to read a few basic chart details though additional magnification may be necessary. Now with that Uranian message, I wish us all a Happy 235th Birthday, America! Though foes undermine you at every turn, you remain my only nag in the race. Yet it's only fair to say that for individuals and for nations, troubles are often self-created - especially when Congress continually neglects its oversight duties - what Senator McCaskill tries to improve upon - while leaders lie us into ill-advised wars begun with Jupiter the General retrograde, a sure signal of a war with a bottomless money pit, and no clear victor left standing. Now either America is a government of-by-for The People, or she isn't. The decision as to which one we'll have "going forward" has now plopped upon our national plate like a slice of birthday cake baked by the universal law of karma for everyone must reap what they sow. Even politicians and their chaos-mongering sponsors are not outside natural law as they grandly imagine themselves to be. Democracy begins when you show up...tag, you're it! I'm afraid Independence Day has been canceled, due to lack of independence. word verification: foxim. Yep, we've been outfoxed by the banksters and their puppet politicians. Word verif tells me the Universe has a sense of humor. We will move out of this yet I absolutely believe and expect this although I will no doubt be an old lady by then being 64 now. This prediction from another Mercury conjunct Uranus in Gemini. We are definitely in a mess now but I trust human nature to want to find a way to be better as we did in WWll. Mercury conjunct Uranus in Gemini absolutely forever young.